I just took delivery of 50 ounces of silver bullion from Northwest Territorial Mint. NWT is a very reliable company, that produces a great many of the unit challenge coins for the US military. They even have an outlet store in the Pentagon. For bulk buying, they are usually one of the least expensive sources. 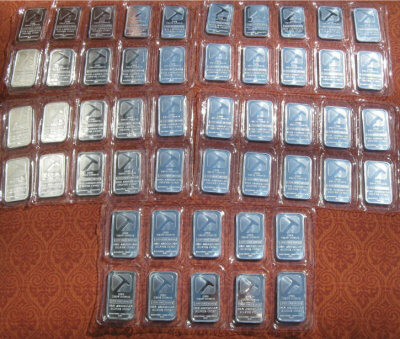 Their minimum order for silver is 50 ounces, and since I only cared about a reliable hallmark, I was able to get it at 99c over spot per ounce, including shipping, handling and insurance, for their Pan American brand. I ordered 50 one ounce bars. For that day, it came to $11.71 per ounce, which is a lot cheaper than the $15-$18 I heard reported as the "Real" price by some experts. Payment must be made at once, and processing starts after the check clears. However, at any point, you may sell the bullion back and collect the difference (Assuming a price gain). Note that you still have to send the purchase check first before they'll send money back--this is not speculating and NWT is responsible enough not to run open debt. They sent a purchase confirmation, first by email, then by USPS, dictating amount, price, terms and delivery condition, plus an account number and web access to tracking info. Delivery was scheduled from when my check cleared in January, for 13-17 April. However, I got notice of shipping, and it arrived April 1st, in a very secure package, adult signature required. The fifty bars are packed in 10 bar thick mylar sleeves for ease of accounting. NWT sells a variety of silver, gold, palladium and platinum bullion and coins. If you're local to them (Seattle area) you can pick up in person and buy smaller amounts. They ship worldwide, have account numbers for government agency purchase, and are very easy and professional to deal with.